Skill Level: Confident Beginner. This class is perfect for beginners, who have made small projects and want to dive into something a little more complex, with help from two skilled and supportive instructors. If you have taken our “Beginner’s Luck” class, this is a great way to build on your skills. It’s also a great refresher for more experienced quilters. It’s great fun, whatever your skill level! Description: Come have fun with Angelina and Beth. Complete this 48 x 48 inch quilt top during class. The pattern has classic bones making it wonderfully versatile. It’s a great size for a holiday wall hanging, lap quilt or baby quilt. Your fabric choices will make it unique to you. Depending on your starting skill set and pace, you may be able to begin quilting in class with guidance from the Beth and Angelina. You’ll receive a detailed pattern, customized just for this class. 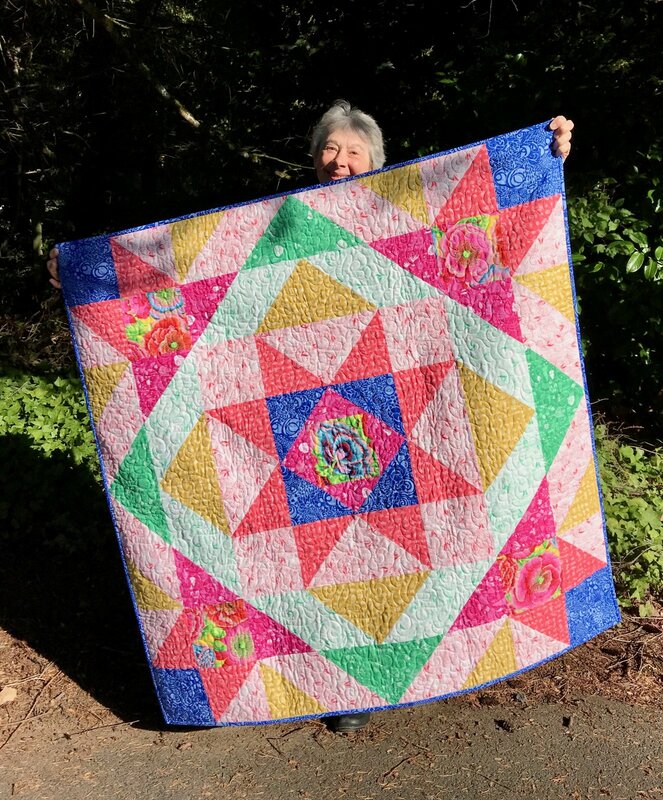 You’ll get not one, but two instructors, so you will get special attention while you learn new ways to make half square triangles, tips on matching points and using new tools. You can download a line drawing of the quilt with fabric placement (you can color the grid to help in fabric placement) and fabric requirements. Check it out here. Save on your ruler purchase: You may want to add a 6 ½ in square ruler to your ruler rack for this project. This will be your go-to square up ruler for years to come. Omnigrid is a brand that has been trusted by quilters for years. It’s what I have on my ruler rack and it’s recommended by your instructors. Right now we have a 6 ½ inch square Omnigrid Ruler, 20% off, just in time to save on one for your class! Purchase a ruler (or just check out the details) here! Fabric Selection: This pattern uses 8 fabrics. Confident quilters can add more, if desired. The expert staff at Ruby Street can help you select the fabrics you need. • Instructions include two ‘focus fabrics’ or fabrics with a large enough print to look nice in a 6” block. These can be ‘fussy cut’. • There are two different background fabrics, either light or dark with minimal pattern that will blend into the background and coordinate with the other fabrics. • Select the rest of the fabrics to coordinate with the two focus fabrics and background. -Sewing machine that you are familiar with. Bring the accessories box (including a quarter inch foot and a walking foot if you have them) extra bobbins and the power cord and foot pedal!! Please make sure your machine is in good working order. Treat your machine to a new needle and a bit of oil before class. There is nothing more frustrating than not being able to participate in a class because your machine is not happy. -Surge protector for your machine. (Using a surge protector is a smart thing to do anywhere you sew, but especially in a classroom where multiple machines, irons and other miscellaneous power tools are using the same circuit). -Your sewing kit with your favorite sewing notions: fabric shears, thread snips or scissors, marking tools, straight pins, basting pins, etc. Plan to bring a lunch or snack for Friday and Saturday or take a quick break to get something from one of the nearby eateries. While attending class, we kindly ask that you park against the chain link fence or on the street alongside the shop. There is also an additional parking lot just across the street from our back door. This kindness will allow access to patients of the chiropractic office and other businesses in our building. Of course, you are welcome to pull right up to the door for unloading. Thank you for understanding.